No matter where we’re dropped off or what country we’re in, we always seem to find our way onto a motorbike (especially in SE Asia). This time we had a plus one, a fellow Chicagoan we met on the overnight bus opted to join us in an adventure where we had no idea what we were doing. 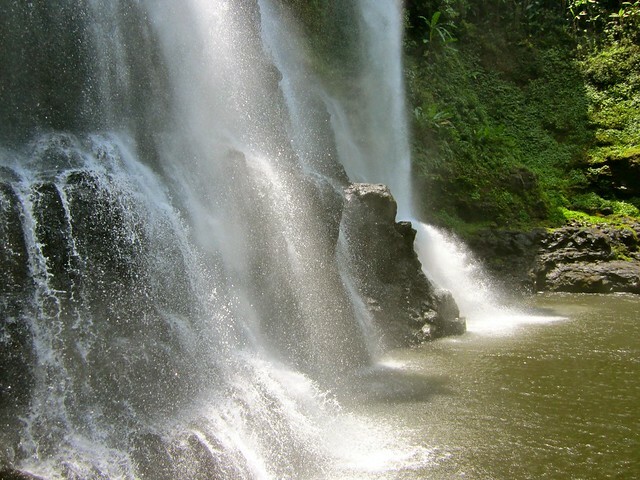 The Bolaven Plateau is an elevated area between the Mekong river and the Vietnam border in Southern Laos. It lies 1,000 meters above sea level, and was one of the most heavily bombed areas in Laos during the Vietnam War. You can find houses built out of bomb shells and unexploded ordinance if you venture off the well-marked trails. 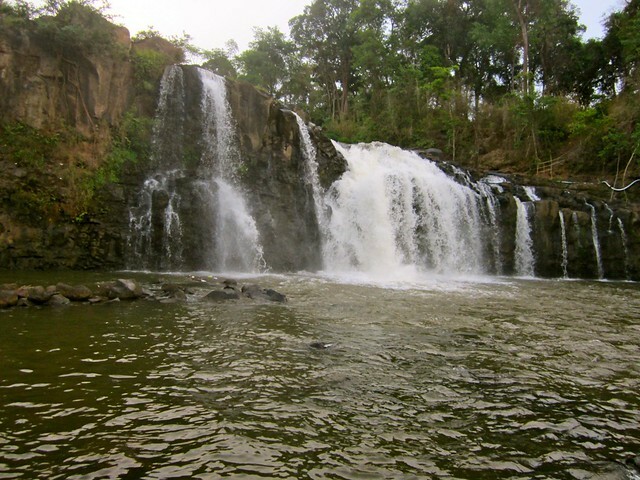 It’s not a huge tourist destination, but offers many waterfalls, beautiful scenery, and a glimpse into the lives of rural Laotians. We couldn’t pass through Laos and miss an opportunity to hop back on two wheels and explore a new area. Arrive in Pakse after an overnight bus trip from Vientiane, find a motorbike, a place to store our backpacks and start driving, avoid spending any more time in Pakse than was necessary. We had a simple map and a general idea of how far each city was from the next. We were lucky that Brian came along since that ensured we had an extra motorbike in case anything went wrong. Nothing we haven’t dealt with before, but the kindness of the Lao family who brought us in from the storm is something we will never forget. It was Brian’s first time on a motorbike and Josh’s first time driving a semi-automatic. Both guys had no problems with the gear changes and I was a lot happier with the long, straight roads compared to our motorbike trip to Pai. 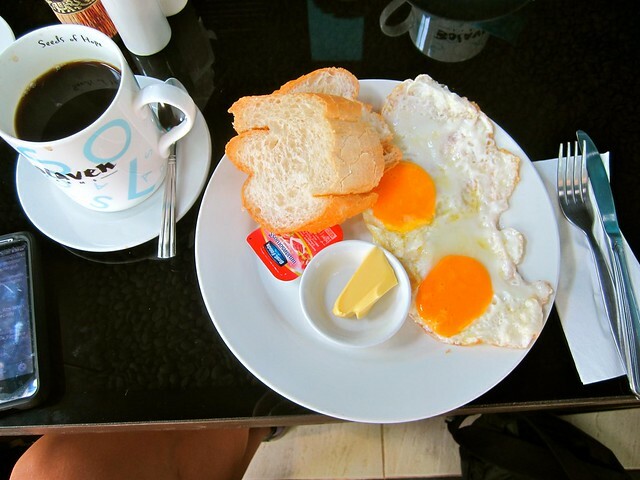 Before leaving we fueled up on a hearty breakfast of fried eggs and baguette at Bolaven Cafe with a huge cup of coffee. We opted to take on the longer route the first day so we would be able to make it back early enough on day two to catch a ride to Don Det. I could put Josh on a motorbike anywhere with no destination or purpose and he would call it a great day. The thrill of driving down new paths is exciting enough for him. 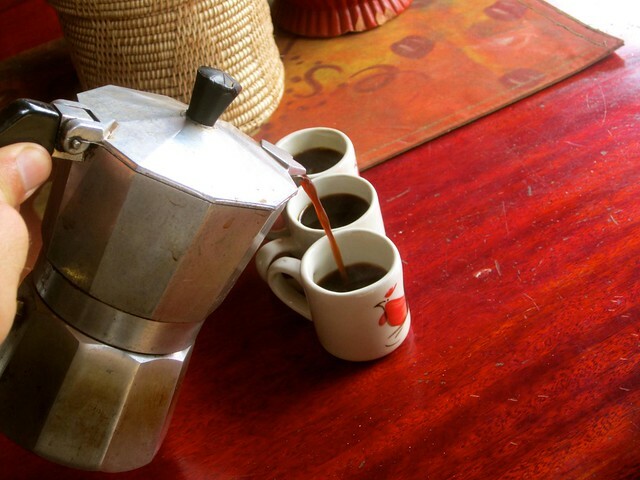 In the city of Paksong, we stopped off for some freshly brewed coffee and enjoyed a strong espresso. After our coffee fix, we watched the town get further behind us as the clouds grew dark and the wind picked up. It would be at least 2 more hours until we reached our destination, and it wasn’t looking like it would blow over anytime soon. 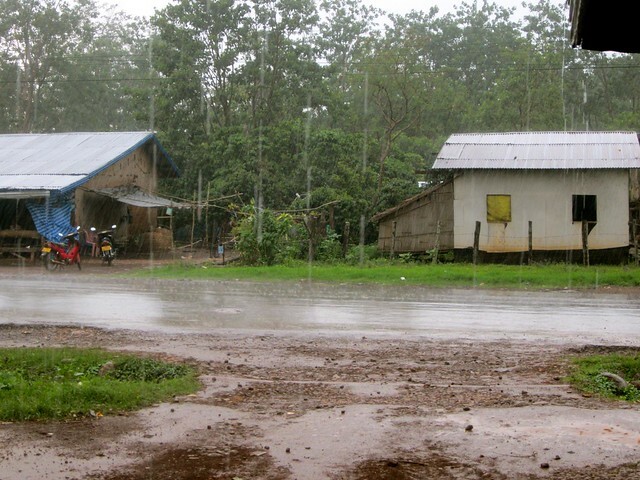 Neither of us had packed our rain jackets, or even a sweatshirt as we left most of our stuff back in Pakse. As the air chilled and it started to rain, I saw a small house/shop that we could pull over in. We don’t speak any Lao and they didn’t speak any English, but they pulled up some chairs for us to sit and wait out the storm. Not even 5 minutes went by before the rain was pouring down and we were blessed to be dry. We purchased some drinks and peanut brittle from the kind lady who ran the store and passed her a heart, thanking her for her kindness. Nearly two hours later the rain had stopped enough for us to venture back out on the bikes. We were pressed for time as we kept a close eye on the clouds and the next big storm, but we made it to Tad Lo without any other issues. There are a few mediocre guesthouses there but we got lucky and stayed at Tim’s Guesthouse. The food was delicious, and the room was affordable (90,000 kip for three people!). The next morning, we woke up early, filled up on coffee and baguettes and got on the road before the heat set in. We stopped at multiple waterfalls along the way, but our favorite part of the drive was all the friendly people we passed along the way. 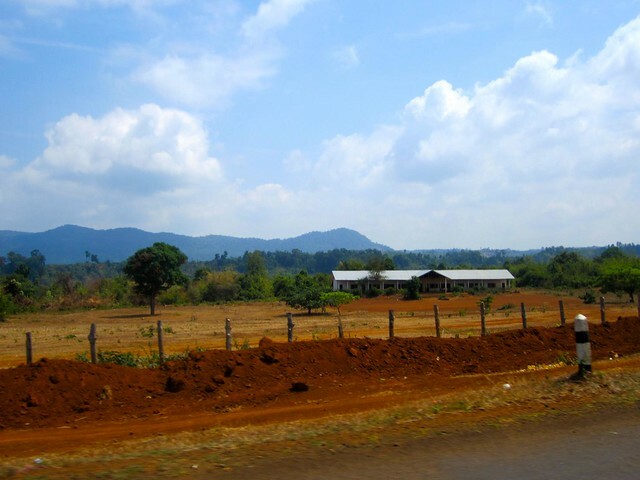 At nearly every village we passed through people would smile, wave and yell, “Sabaidee!” (Hello in Laotian). The children were especially cute running out to the road to greet us. 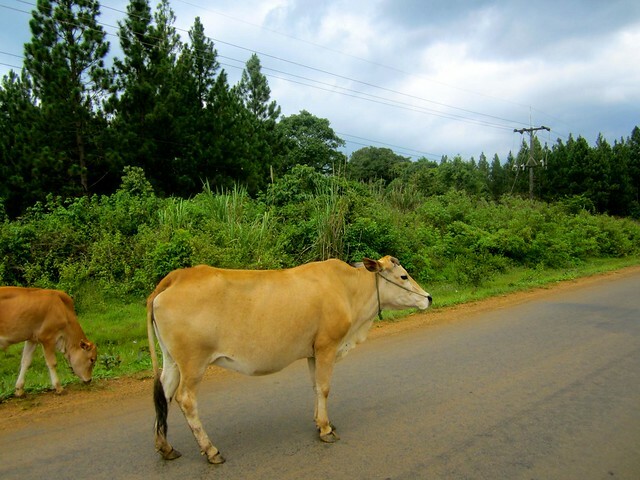 This alone made the Bolaven plateau one of our favorite parts of Laos. If waterfalls, motorbiking and friendly locals interest you, I would recommend a few days driving yourself through the Bolaven plateau. Especially after visiting the more developed cities on the backpacker circuit, the plateau reveals the real Laos you can only know by experiencing it yourself. I love reading about off the path travel. Such a great experience when you just venture out with only the vaguest of plans! The last time I got on a moped i totally wiped out on some gravel… so I don’t know if i’ll be back on when i’m in SEA this summer. Your article has inspired me though, so maybe I’ll finally rent another one!